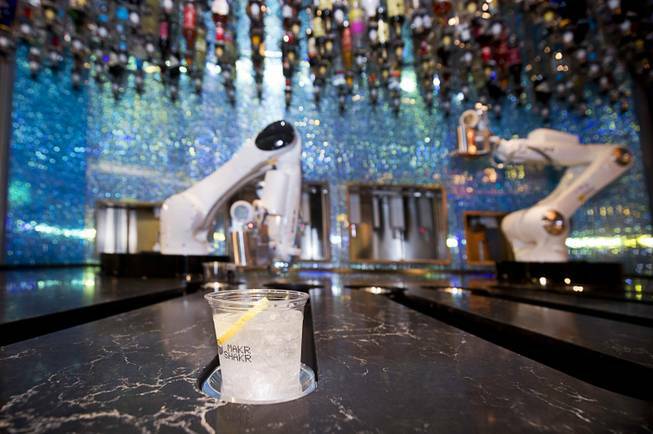 With gadgetry worthy of a James Bond movie, the bar of the future has arrived in Las Vegas. And you don’t have to be a spy to get your martini shaken, not stirred — by a robot. 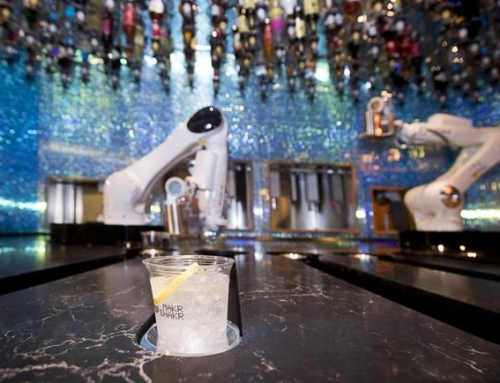 Two robotic arms have replaced bartenders at the Tipsy Robot at the Miracle Mile Shops. They can’t listen to your woes, but they promise to make you the perfect cocktail. 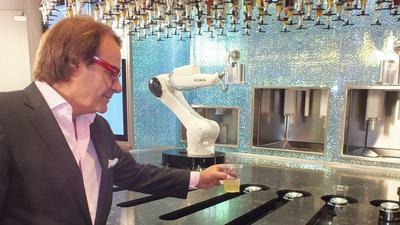 Tipsy Robot, which opened Friday, claims to be the world’s first land-based bar to deploy robotic bartenders. If the technology sounds vaguely familiar, that’s because it has been used on Royal Caribbean cruise ships. Here, using tablets, guests select their drinks, which could be as ordinary as a gin and tonic or as fancy as a signature cocktail. You pay the tab by swiping a credit card or giving cash to a human employee. It takes the robots 90 seconds or less to prepare each beverage, even if they need to cut a slice a lemon or lime as a garnish. Once a cocktail is ready, the guest’s name appears on a large screen. Patrons then scan a QR code that has been sent to their cellphone to collect their drink. one of the two robotic bartenders deployed at Tipsy Robot. Armeni expects the entertainment factor to be a big draw. And entertain they do. 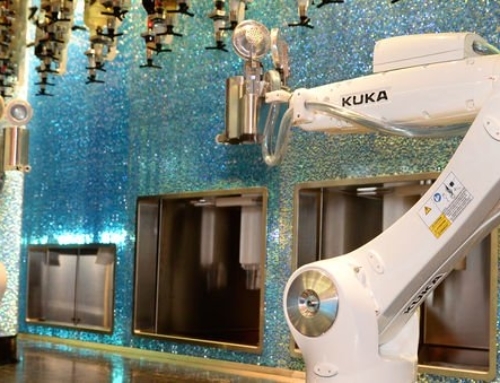 When not busy making drinks, the robotic arms “dance” to the music being played. Plus the potential for human error is eliminated. 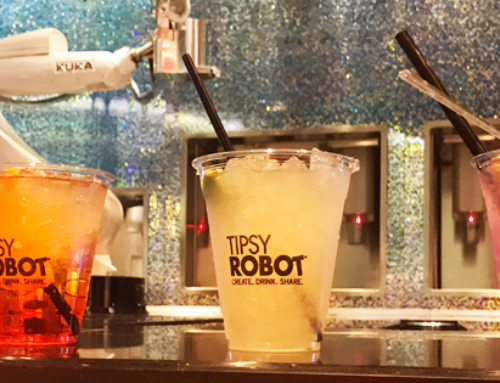 The robots are programmed to blend precise quantities and put exactly the right amount of booze, mixers and ice in the 12-ounce plastic cups. Take, for instance, the “Galactic Grapefruit,” one of Tipsy Robots’ custom cocktails. To make it, a computer tells the robots to mix seven parts of ice with two parts Casa Dragones, two parts Tres Agaves mixer, one part club soda, one part Sprite, one-half part Fruitations grapefruit mixer and lime. 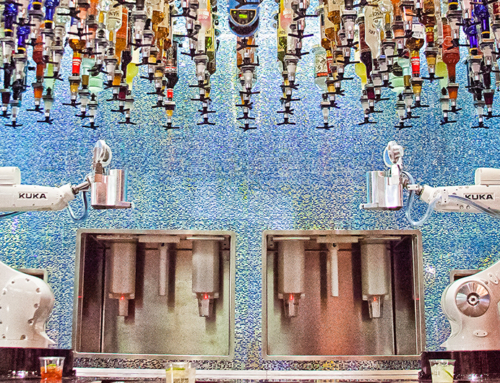 Guests can create their own cocktails, blending booze (from among the dozens of bottles hanging from the ceiling) with 16 types of fruit syrups and soda.